Isaac is nearly 18 months old. I can't believe that it was only 18 months ago that I gave birth to our baby who is growing into such a cheeky, adventurous, hilarious little boy. I have been doing much better with life and motherhood in general over the last few months, particularly since going back to work as you might have read in a previous post. Compared with those first few months, things have changed so much, and for that I am so glad - but over the last couple of weeks I've come to realise that there are still a few things I haven't really dealt with or come to terms with when it comes to my journey with postnatal depression. On a side note, someone said to me that by blogging, sharing and talking about this journey, I am never giving myself the chance to "move on" (yes, I was really infuriated, but have to accept that sharing things in a public forum is going to spark conversation with people I know); but I wholeheartedly disagree. This blog and my social media accounts have helped me so much, they have helped me process my thoughts in a healthy way and create discussions with parents (and non-parents) from all over the world, as well as people I know. I am annoyed that I feel like I have to justify myself, but here I am. Anyway, back to my point - a fair amount of psychological help throughout my life has shown me a lot of different coping techniques and strategies for getting through anxious/depressed periods. From exercise, CBT, exposure therapy, meditation and the list goes on. Last week, my sister and I went to a Pilates class and at the end was a few minutes of relaxation. It's meant to be an enjoyable part of the class; but I started to get incredibly anxious and feel overwhelmed. I was trying really hard to listen to the teacher's voice and follow her instructions, relaxing muscle groups and "letting go" of thoughts as such. Instead my whole body started to feel fidgety, I couldn't keep my legs still, I couldn't focus on the teacher at all, I felt like the room was spinning and I started to implement techniques to hold off a panic attack. I was meant to be relaxing, I was meant to be doing something enjoyable, having a break and enjoying some time-out. Moving my body in a way I enjoy, surrounded by a small group of women all with their eyes closed, enjoying a lovely, relaxing few minutes. "Oh God, I feel like I'm drunk, why is the room spinning?" "Katy, you're being ridiculous, just breathe and let your muscles relax"
"I am really scared of driving home after this"
"I feel sick, I can't breathe properly, how embarrassing if you're going to have to leave the room"
"What the hell is wrong with you? Just RELAX"
"Keep your eyes closed, you're meant to be breathing deeply and ENJOYING this"
"Far out, my labour was terrifying - could I ever go through that again?" Hang on... where did that last point come from? Why on earth would I start thinking about labour when I felt panicky in a Pilates class? I thought about it more after the class was over and realised that I actually think about my labour a lot. The trauma of that time, the fear, the thought that I could have died and so could Isaac, the pain, the lack of information given to us about what was happening, the lack of respect for what I wanted and my fear of standing up for myself - just the whole thing still overwhelms me and I would say I think about it daily. It wasn't until last week that I really realised how much of an impact my labour had on my freefall into postnatal depression/anxiety. I have definitely talked about it; with my psychiatrist and my psychologist, but maybe not enough? Clearly it's still a really big fear and something that I associate only negative things with. Pretty much every Mum I have spoken to says that everything was worth it as soon as they held that precious baby in their arms. That is just not how I felt. I was shell-shocked for at least 24 hours after my labour. I honestly felt like I was in a dream state. Foggy, exhausted, still in so much pain (like most Mums after labour I'm sure) - but I didn't have that positive rush of emotion that I was expecting and so badly wanting. 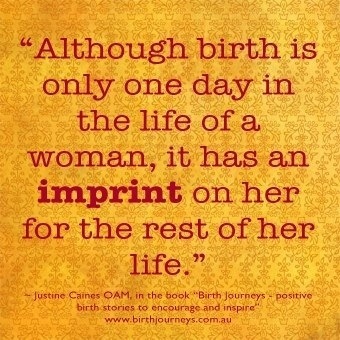 I wanted a natural birth throughout my pregnancy if I could, but was never against a C-section, I just wanted whatever was safest at the time for my baby. What I went through was ultimately unnecessary, having asked for an epidural and basically being told I didn't need it, then going through more hours and hours of pain, my baby boy not able to be pushed out but still having to try for over two hours before my Obstetrician arrived to assist with the Ventouse and even explain that Isaac was presenting face first which is why everything was so difficult. I think I feel angry. 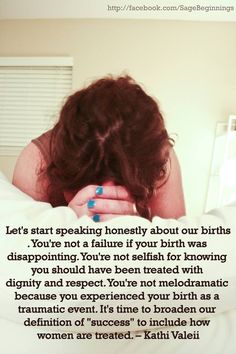 I feel angry that I wasn't treated how I wanted, my wishes were largely ignored, I didn't know how to fight for myself and honestly just assumed that our midwife knew best. The fact that she later lied to our obstetrician saying I REFUSED an epidural just adds insult to injury. If I had been given a chance to rest, if someone explained what was happening - there are lots of different scenarios that could have resulted in a totally different mental outcome for me. I'm not saying that I wouldn't have ended up with PND regardless, my high levels of anxiety previous to and during pregnancy made me a high risk candidate, but I just feel like things could have been different. Obviously, my labour experience is not as bad as others, but it is my own and I will not be made to feel that I can't talk about it just because it's over. Clearly there are things I haven't processed and dealt with and need to "dwell" on in order to come to terms with what I went through and how difficult I am still finding it to accept. I am really grateful that for the most part, I am doing much better. I clearly still have issues that I'm dealing with and I can't (nor can others) expect there to be a specific timeframe. As usual, I will keep sharing, keep the conversation going and keep being a listening ear to anyone who wants one. Birth is beautiful, I totally get that; but it is not always a positive experience, and it can have lasting effects not only physically, but clearly emotionally as well. I hope one day I will accept my experience and feel able to consider going through it again - I know next time would be completely different if not only for the knowledge I have gained having already been through it. Sorry for the negative, rant-y tone of this post, but sometimes that's where my head is at. Please don't dismiss people's feelings; I get that you may not understand but some people just need time.